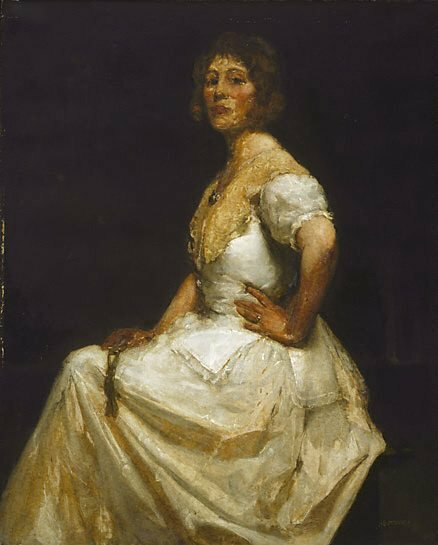 Silk and lace was awarded The Archibald Prize in 1926. The subject of William McInnes's fifth winning portrait was artist Esther Paterson. The work was acquired in 1927. Signed l.r. corner, brown oil "W.B. McINNES". Not dated. Erik Langker, Art Gallery of New South Wales quarterly , 'The Archibald prize', pg. 51-56, Sydney, Jan 1961, 51, 52 (illus.). Sydney Ure Smith (Editor), Art in Australia [series 3, no. 19] , Sydney, Mar 1927, 13 (illus.). Anna Waldmann, Art and Australia (Vol. 20, No. 2) , 'The Archibald Prize', pg. 213-236, Sydney, Summer 1982, 214 (colour illus.). The Archibald Prize: an illustrated history 1921-1981 , Sydney, 1981, 214 (colour illus.). Let's face it: the history of the Archibald Prize , 'The Early Decades', pg. 16-31, Sydney, 1999, 21 (colour illus. ), 22, 122 (colour illus.). Let's face it: the history of the Archibald Prize , 'Chapter 2: The early decades', pg. 15-37, Sydney, 2005, 18 (colour illus. ), 19, 133.